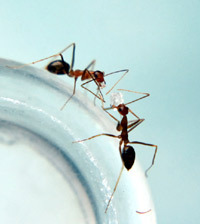 It is important to note that ant-proofing your home will also decrease the number of cockroaches, moths and beetles, and by extension predators like spiders. 2. How are they getting in? 3. Where is the nest? One of the first things you want to do is set out ant bait. These offer ants a "final meal" that they take back to the nest and effectively stop the invasion. You probably will have to clean up live ants during the ant-proofing process. When you need to kill a quantity of ants, use either a sponge soaked with soapy water or a spray bottle filled with soapy water. The soap helps to kill the ants while you clean them up so you don't have to squish them all. You don't necessarily have to use that particular mixture; there are a plethora of other effective cleaning solutions that can be made with household items. When you do locate a string of ants, take a few moments to study them before you start sending them to their soapy death. Try to find where they are going and where they are coming in; this way you can eliminate the sources. Seal up any openings that they are coming in from with a caulking sealer. � Store food in rubbermaid type plastic containers, jars with lids that have sealing gaskets, or jars with tight-fitting hinged lids. � Refrain from storing anything in the open or in bags. � Jars without sealing gaskets can permit ants to enter through the threads, so replace any that you find with the above mentioned containers. � Clean out your toaster or toaster oven after every use. � Clean (with soap) all of the surfaces in your kitchen at least once a week to remove crumbs and food residue. � Sweep or vacuum the kitchen floor weekly. � When throwing away food wrappers or containers, rinse out any remaining organic material first. � Save all of your organic waste in a sealed container and dispose of it separately. Either compost it in your garden, or throw it in the trash bag as you take the garbage out. � Use trash liners (bags) and ensure your trash can has a tight-fitting lid. � Rinse out the trash can if it ever gets grime or garbage on it. Ant barriers Once all of your cabinets are packed away neatly, take a good look around for anything else that may be attractive to the ants. Potted plants, unprotected pet food, open bowls of fruit or nuts are all possible targets. You can keep these things safe by erecting barriers that the ants can not or will not cross. This is important in the list of how to get rid of ants! Sticky goo's like Tanglefoot are normally avoided by ants. Use them on table legs and around plant platters and pots. They can also be used on the stems of plants that you wish to protect in the garden. Detergent barriers are made by placing something (a potted plant or your pets food dish for example) in a larger dish or platter partly filled with a water and detergent mix to create a moat. The detergent will break the water's surface tension causing any ants that attempt to cross it to drown. While you're in the swing of things, you might want to read up on some of our useful house cleaning tips and get a head start on those chores you've been putting off!